What is it with Red Bull? As you know we are all about extreme sports and in our endeavours to bring you interesting news and stories we do a lot of research into all kinds of whacky things that people get up to both in their spare time and professionally. One name that keeps popping up all the time is Red Bull. Beyond the high energy drink what is it with Red Bull? Red Bull was founded by Dietrich Mateschitz, an Austrian businessman and billionaire, whose parents were Croatian and who currently owns a 49 per cent share in the energy drinks giant, Red Bull GmbH. He was born on May 20 1944 in St. Marein im Murztal in the region of Styria. Life was fairly ordinary for Mateschitz as he grew up in Austria. He attended the Vienna University of Economics and Business Administration and graduated with a marketing degree after ten years. After finishing his degree, Mateschitz went on to work for Proctor & Gamble, where he was employed within their marketing department. He progressed up the career ladder to eventually become the marketing director for Blendax tooth paste. It was during one particular business trip that the initial idea for a stimulant beverage began to take shape. In 1982, when sitting in a hotel in Hong Kong and suffering from jetlag, Mateschitz was musing into the popularity of ‘tonic drinks’ that were big sellers in the Far East when the idea of selling similar beverages in the West came to him. He then went on to form a partnership with a couple of local businessmen who were already producing a drink called ‘Krating Daeng’ (Thai water buffalo) and it was from this that Red Bull was born. 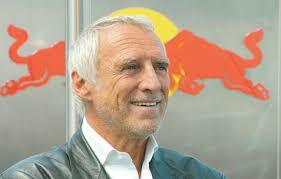 He founded Red Bull GmbH with his Thai partners Chaleo & Chalerm Yoovidhya. It was agreed that Mateschitz would run the company and after much research, testing and set backs, the caffeinated energy drink was finally launched in Austria in 1987. Red Bull was an instant hit in it’s native country and as sales continued to grow, it was launched in other European countries. Not everything went so swimmingly though. Sales in Germany suffered as supply couldn’t meet the demand of 1 million cans per day and the product had to be re-launched six months later. France and Denmark banned the sale of the drink due to health concerns over the high caffeine level and the use of the chemical taurine. But health issues aside, over the years Red Bull has managed to take a strong foothold in the competitive drinks market in Europe and America. In most countries, it lines up third behind the likes of Coca-Cola and Pepsi in the total number of cans consumed. By 2008 sales of Red Bull had increased by 17% on the previous year to 3bn Euros ($4.4bn; £2.3bm) having shifted 3.5bn cans in 143 different countries. These impressive statistics are mainly due to clever marketing which has increased the profile of the drink through non-traditional advertising streams. From the outset the Red Bull brand has been associated with a variety of glamorous and exciting sporting events such as mountain-biking, snowboarding and paragliding. With Mateschitz being the marketing strategist that he is, he saw the potential on offer by tapping into large audiences and giving the Red Bull brand a “cool” image by being linked with sports and athletes. The profile of the brand seemingly increasing as a result of the many extreme sporting events the company sponsored. So what are the extreme sports that the company sponsors. What follows is a compendium of just some of those extreme sports. Well that won’t be all – we are bound to have missed a few out – other than the energy drink then this is what Red Bull is about – marketing. It sponsors events and individuals in these high profile sporting events – what brilliant marketing – something Mr Mateschitz obviously learnt very well during his ten years at university. To add to the fun we thought you would appreciate a couple of videos of extreme sports that Red Bull is supporting. The first, not surprisingly from redbull is of some truly awesome action from Red Bull Rampage – mountain biking in Utah. The second is again from redbull of the Snowscrapers event held in New York in February which was won by Shayne Pospisil. This one from redbullusa demonstrates the humourous side of Red Bull – some crashes from soapbox racing at an event they sponsored held in Seattle. No doubt about it – a great combination of fun, sport and adrenaline – keep up the good work Red Bull. Continuing our series on how to kite surf we have found two videos which we believe you will find extremely useful as a beginner to this exciting sport. The first video from How2Kite demonstrates how to ‘play the piano’ with one hand. This is essential knowledge as when you are putting the board on your feet you only have the one hand to control the kite. By moving your hand to the right or left of the centre of the bar – as if you were playing the piano – you will find that the kite moves in the opposite direction. The skill is to have enough finesse in your hand not to over-do the correction. When putting the board on your feet you should be aiming to have the kite above your head at an imaginary 12 o’clock. The second video from andxto99 is an excellent demonstration on how to execute the water start, we suggest one of the first and most essential lessons to learn. As we have just learned you will be keeping the kite overhead by playing the piano and you will be holding your board with your other hand. As you go into the water try to keep the kite out to sea and at a low angle as this will avoid any gust taking you airbourne when still on the beach. Once in the water place the board in front of you and then put one foot into the boards footstrap, and then the other, making sure your feet are secure. Allow yourself to be pulled down wind by the kite. When ready for launch you have to dive the kite into the power zone in the direction you want to go. Place the kite at 11 o’clock and dive it down to 2 o’clock and the kite will have the power to pull you out of the water. Remember to bend the knee of your back leg and extend your leading leg. Sounds easier than it is but remember there is a first time for everyone – keep practicing, take lessons, don’t rush, build your confidence. Kite surfing, THE top extreme sport of the moment, has been written about regularly on our blog, as have many of the other uses you can put your kite to such as kite board and kite ski-ing on snow or sand, kite with all-terrain roller blades or mountain board, and kiting with a hydro-foil board. One sport we haven’t given much coverage to, as yet, is parakarting – or kite buggying, said to be one of the most popular forms of power kiting. This sport combines the force of the wind using a large power kite and a 3-wheeled buggy with no brakes but a whole lot of speed! Sound like fun? The buggy is single-seated and has one steerable front wheel and two fixed rear wheels. The driver sits in the seat in the middle of the vehicle and accelerates and slows down by applying steering manoeuvres in coordination with flying the kite. He is not strapped in. Thanks to ventoactivo for posting this video. Kite buggying has an interesting history. It is thought to have been invented in China around the 13th century and was introduced into the western world by George Pocock, an inventor in the UK in 1827. Kite buggies became commercially available in the US and UK in the late 1970’s. Peter Lynn is generally credited with the modern popularity of buggies and kite buggying when, in the early 1990’s, he designed a strong, lightweight, affordable buggy. If you are a newcomer to this sport it is adviseable to start with a relatively small kite in relatively low wind conditions (e.g. 2 to 3 m² kites in winds of force 2 to 3) and progress to bigger kites or higher wind conditions as ability improves. Novices should first master full control over their kite before considering the next step – the actual kite buggying bit. Buggying can be done on a number of surfaces including grass, sand, ice and tarmac. The speed achieved in kite buggies by skilled drivers can range up to around 110 km/h (70 mph), and for this reason protective clothing is advised – including a safety helmet. This involves the pilot being physically attached to the buggy by means of a lap belt and uses a relatively large kite. He flies the kite overhead to generate maximum lift and is then—with the buggy—hoisted up to tens of feet into the air. Very advanced pilots even perform aerial manoeuvres such as 360° (or more) spins, sidewinders, pendulum swings and reverse landings. Kite buggying can be classified as an extreme sport. Wind is the only power source and is often very unpredictable. An attitude of caution and respect towards the wind is essential, for the novice as well as the advanced pilot. Remember, a frequent cause of accidents is flying a kite too large for the wind conditions and for the experience of the pilot. In such a case, buggy and pilot tend to be pulled downwind, often skidding and sliding sideways with a high risk of the pilot entirely losing control of kite and buggy. This can be avoided by flying kites small enough so that they allow the pilot to safely stop the buggy by turning it through the wind and driving upwind. This hasn’t been quite true for Anne Quéméré. Although nearly halfway through her epic voyage, she is still in the Doldrums but definitely figuratively not literally – her news is upbeat and positive although finishing her last piece of fresh food – an apple, was a sad moment! Ever since being in the Doldrums she has had non-stop rain though fortunately these storms have been accompanied by strong southerly winds which she has been able to take advantage of. So what exactly are these fabled Doldrums? The Doldrums, also known as the Intertropical Convergence Zone (ITCZ), is the low-pressure area around the equator where the prevailing winds are calm. The low pressure is caused by the heat at the equator, which makes the air rise and travel north and south high in the atmosphere. It is drawn into the intertropical convergence zone by the action of the Hadley cell, a macroscale atmospheric feature which is part of the Earth’s heat and moisture distribution system. It is transported aloft by the convective activity of thunderstorms; regions in the intertropical convergence zone receive rain over 200 days in a year. It subsides again in the horse latitudes. Some of that air returns to the doldrums through the trade winds. This is a real learning curving… so what are the horse latitudes? These are subtropic latitudes between 30 and 35 degrees both north and south. This region, under a ridge of high pressure called the subtropical ridge, is an area which receives little precipitation and has variable winds mixed with calm. Now this is an interesting little piece of history. 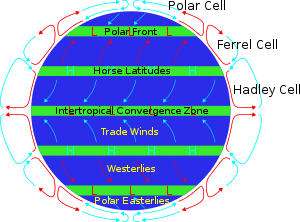 Why the name horse latitudes? The name supposedly originates from the days when Spanish sailing vessels transported horses to the West Indies. Ships would often become becalmed in mid-ocean in this latitude, thus severely prolonging the voyage; the resulting water shortages would make it necessary for crews to throw their horses overboard. Gruesome isn’t it. Poor horses… perhaps the relic of that piece of history are angry wave caps being called “white horses”… what do you think?! Stretching it a little perhaps?! Anyways, back to Anne Quéméré. “Here, its always the same solitude: no cargos in sight and no sails heading South. My radar is working constantly, especially at night when I sleep. On certain days, I’m so tired, a herd of wild cargoes could cross my route and I wouldn’t even notice it,” she says. She is hoping that a little more than 4° Longitude and she should start seeing some sunshine. That means, in the best of conditions, another 5 days if the wind holds.